Oops - we don't appear to have a video for the CR-55. The Cheque Truncation system - allowing the exchange of data and cheque images electronically - has created the need for a cheque scanner for counter use. The CR-55 is the answer - a compact, affordable and productive device with an outstanding handling accuracy. At 2kg, the CR-55 is as light as a laptop, and its dimensions (223mmx140mmx188mm) ensure it sits comfortably on the smallest of desks or counters. With the CR-55 by your side, it's easy to scan in high quality at a class-leading 55 cheques per minute, using 24-bit colour, black-and-white, and greyscale image reading. Canon's heritage in paper-based document feeding is used in the CR-55 to ensure exceptional reliability. Fifty cheques can be loaded at once and an infra-red sensor uses two different, sophisticated calculations to detect double-feeding, for trouble-free operation. It also allows the CR-55 to handle multiple cheque types and sizes, which can restrict competitive devices that only use cheque length to identify double-feeds. However, in the unlikely event of a cheque feeding error, the device is designed to make resolution quick and simple, via an easy-access maintenance cover on the side. The CR-55 can read Magnetic Ink Character Recognition fonts with a 99.9% reading ratio. Innovative design also ensures that there is no interference caused by static electricity and radiation from PC monitors. 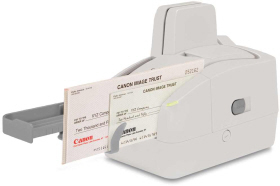 An imprinter unit is built-in to the CR-55 which can print endorsement information on cheques prior to scanning. Canon's scanning software allows scanning, file saving and viewing and other functions to make operation effortless. The widely recognised Ranger Driver from Silver Bullet is also incorporated which enables system integrators to incorporate the CR-55 into their workflow.